The way things normally work on this blog, more through neccessity than anthing else, is that I visit a restaurant once, then write it up. I'd love to be able to exhaustively work through a menu before making up my mind, or visit at different times of the week to assess the different service shifts, but as you can hopefully appreciate, I have neither the time nor the money to report on anything other than a single, initial visit. If you want expert analysis, try the New York Times. Now you may think that's unfair, but I can honestly count on one hand the times, in over 8 years and 500 blog posts, that I've really wanted to drastically revise a score after a second visit. Tayyabs would get more than the 8/10 I settled on after somehow failing to order the tinda masala way back in 2007, and perhaps I was a bit easy on Ping Pong given the much better, and much cheaper, dim sum restaurants I've been lucky enough to eat at since. But generally it's surprising how little a repeat visit changes much. So you'll just have to take my word that although I've stopped by at Racine semi-regularly over the last few years, and have had ample time to question and revise any snap judgments I may have made on the first visit, my opinion of the place has hardly altered since I first set through the door one cold winter's day back in (I think) 2009. Namely, it's a lovely little restaurant serving very nice food and I like it very much. And here's why. Firstly, there's a menu of regional French dishes with phrases like "Deep fried snails & bacon" (above), "Calf's brain with capers", and "Pâté de foie de volaille" used with appealing confidence, it's enough to make you want to drape a string of onions round your neck, wear a beret and scoff the lot. There's also that soft, dark room, white tablecloths and cozy bench seating in the traditional Parisian bistro style, and immaculately-appointed staff that glide about with surprising ease considering how closely packed some of the seating is. But most of all, there is the grouse. Every year, as soon as the season starts, restaurants in London fall over themselves to be the first, the cheapest or make the most innovative use of this wonderful game bird. Gymkhana tandoori spice it, the Lockhart deep-fry it, the Ledbury hay-smoke it, more than one Modern British restaurant sous-vide and daintily joint it into geometric shapes and drizzle jus around it. And good luck to them all. But there's only one way to enjoy grouse as far as I'm concerned, and that's roasted, sat on toast spread with paté, and accompanied by chips, game and bread sauces. And there's nowhere does that better than Racine. I feel the same way about people who don't like grouse as I do those who say they don't like pongy cheese or caviar. I'm not contemptuous, I do sympathise; I can completely understand where they're coming from - these are strong flavours, deep, funky, grown-up flavours that sail perilously close to tasting of things that you'd normally cross the street to avoid, never mind eat. But if you can get past that, there's something deeply rewarding about eating something that tastes of where it came from; of wet moorland, heather, summer berries and yes, of dead animal. This is not a sanitised, abstract lump of protein bred in a cage and carefully carved free of personality. Roast grouse forces you confront the realities of your dinner - it lived, it flew, it was shot, it died, and here we are. Of course, there are always other reasons to eat at Racine, such as the aforementioned deep-fried snails and bacon, accompanied by poached duck egg and leeks. I also tried a bit of someone's light prawn and crab cocktail (very good) and even a fairly humdrum-sounding goat's cheese and tomato salad (above) was made more interesting by some very good tomatoes and sprigs of fresh basil. I have also, in the past, enjoyed some wonderful steaks (the current offering is a côte de boeuf for two with Béarnaise sauce for £52, which I happen to think is pretty good value) and I have a lot of time for their signature garlic and saffron mousse with mussels, something which sounds pretty odd on paper but always impresses. I'll forgive them the 14.5% service charge which seems a bit cheeky in a city more used to 12.5%, and for their perhaps slightly underwhelming dessert offerings (somewhere this French should be doing tarte tatin, surely?) because they also do a £17.50 lunch special (hangar steak, Béarnaise, chips and a glass of wine - bargain) and said 14.5% service is admittedly excellent. But mainly, I'll keep going back to Racine for the grouse. Some things you just don't mess with. Surely, I thought, surely I couldn't score the full set with my meals in Dorset/Somerset. I was due at least one dud, one hapless gastropub serving frozen fishcakes and Argentinian steak; at least one sweet vodka cocktail served on the rocks in a martini glass; a cheeseboard boasting Port Salut, Edam and a cheddar studded with dried apricots. I mean I'd travelled all this way to have my prejudices about provincial restaurants confirmed so I could write the usual sighing, smug, faintly patronising London-centric post about how this part of the West Country was "well on its way" to being a foodie destination but "not quite there yet". Wouldn't somewhere give me what I wanted? The Old Spot was my last shot, and all the pieces were in place. 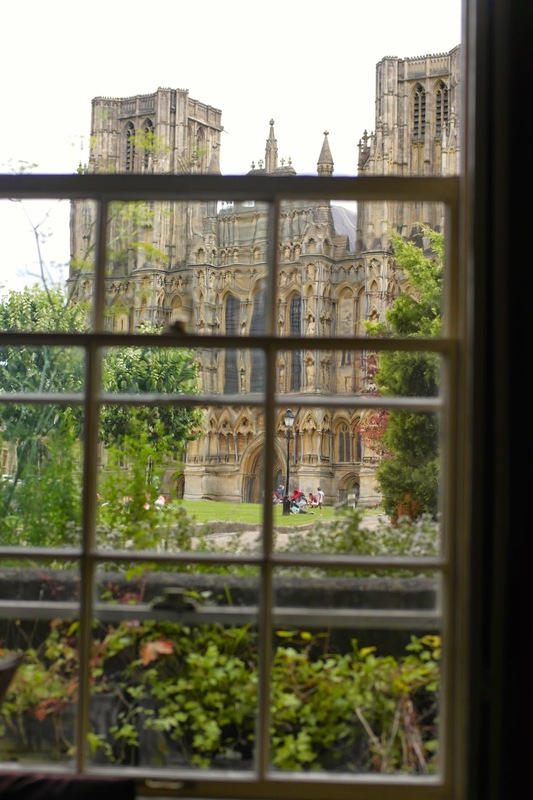 A high street restaurant in a pretty old honeypot town is a classic location for a mediocre tourist trap, and that's exactly what I expected to find here in the shadow of Wells cathedral. Outside, this ancient building was characterful and welcoming; inside, it had been carefully stripped of most of the period charm and felt a bit like when they carve out some ancient Tudor building in Chester for a depressing new branch of Zizzi's. "Aha, I've got their number" I thought. "Bring me your laminated menu and a large glass of Pinot Grigio and let's get this over with". Except those stubborn people at the Old Spot refused to play ball. Our welcome was charming and personable but also sharply efficient, a level of practised confidence about every movement they made. The menu wasn't laminated, or boring, or confused; it contained 15 carefully-chosen crowd-pleasing modern British/European dishes, making a decision about which to go for rather difficult. And the wine list, dotted with charming informal notes, contained some genuinely surprising options for pre- and post- dinner drinks, such as local apple brandy, Eau de Vie, sherries and Pineau des Charantes. Bella Italia this was not. And then the food arrived, and that was it - I was defeated. It was, all of it, quite lovely, not least the house bread from master boulanger Bertinet in Bath, an attention to detail that informed every part of the food offering at the Old Spot. Fish hors d'ouevres was springy pickled onion, a wonderful rich tarama-style roe paste, a croquette of some sort (OK so there was a fish cake, but it wasn't frozen) and a little beetroot chutney thing. All fresh, interesting, enjoyable. But while the fish starter had been solid and very pleasant rather than anything extraordinary, Gazpacho was a supreme example, and a delight to eat. The tomato mixture was a deep orange, with a flavour that matched, rich and ripe and hot with garlic. Texture came from delicate chunks of lightly fried bread, neither tooth-breaking nor soggy but perfectly in-between. And finally, colourful chunks of cucumber, shallots and torn herbs, no element overpowering, and not an ingredient too far or too few. Fillet of salmon came with a golden crusty skin, faintly oily, flaky flesh and a shrimp-caper-butter sauce that contained all the correct features (salt, fat, sugar) to compliment this, the third beautifully-cooked bit of fish in as many days. Even something as ordinary as boiled spinach seemed better than usual; probably because it was soaked in shrimp butter. Lovely tender slices of lamb leg, all pink and bordered with crunchy ribbons of fat, sat upon couscous studded with Merguez sausages and blobs of hot harissa. As with the other dishes, there was nothing here going to win any awards for innovation, or wild liberties taken with flash ingredients, just nice fresh food, cooked well, served with the minimum of fuss by people who knew what they were doing. And sometimes, that's more than enough. The second crème brûlée of the weekend, vanilla cream under a satisfying toffee crust, provided a full stop to this, the final meal of the weekend and with heavy hearts (though that may have just been indigestion) we traipsed back to the hotel to pick up our bags and headed back to Yeovil Junction station. Much like that glorious weekend in Cornwall, the restaurants and hotels in Dorset and Somerset had dazzled with their generosity, amazed with their skill and pretty much smashed apart any lazy preconception I care to held about extra-M25 dining. But unlike the 7-hour travel commitment to get to Cornwall, Yeovil Junction and the glorious Little Barwick house is 2 1/2 hours from Battersea. The West Country, you have done yourselves proud. Now, where's next? We were guests of The Old Spot restaurant, 12 Sadler St, Wells, Somerset BA5 2SE. We travelled to Yeovil Junction with South West Trains. For the best offers go to www.southwesttrains.co.uk. (Most) photos by Hannah.